There was recently an article in the consumer report which stated that seventh generation natural laundry detergent wasn't biodegradable. Thank you for e-mail and question. Our laundry powders and liquids are completely biodegradable and "do not" contain petroleum based surfactants or softeners. I respect that question in the wake of the article in Consumer Reports. On a side note, our dish powder and gels will be modified shortly to replace the small percentage of petroleum derived ingredients in those products. I hope you find our laundry products to be a match for your needs and we appreciate your patience as we adapt with our product efficacy. Have a great Thanksgiving. Seventh Generation Natural Laundry Detergent combines vegetable based surfactants and enzymes to not only to remove the dirt and stains from your clothing, but also to be eco-friendly. What are surfactants? The short, easy answer is that a surfactant is the all-important ingredient in detergent or soap that breaks the surface tension of the water. Essentially, that means that fabrics placed in the soap or detergent will get much cleaner, as opposed to simply swishing them around in plain water. This biodegradable detergent is marketed as non-toxic and hypo-allergenic. The ingredients in Seventh Generation Natural Liquid Laundry Detergent are: water, corn and coconut based surfactants, glycerin, non-animal-derived enzymes, natural water softener, borax (an alkalinity builder), sodium gluconate (an agent to wash away soils), salt (viscosity control agent), natural fragrance (citrus oil) and preservatives (less than 0.05%). for using Seventh Generation Natural Laundry Detergent seem to far outweigh the cons. To begin with, conventional laundry detergents most likely contain ingredients that will leave a residue behind on your clothes and towels, which can make your skin itchy and irritated. This environmentally friendly detergent doesn’t irritate sensitive skin since it doesn’t contain any dyes, petroleum based cleaners, chlorine, masking agents, optical brighteners, or phosphates. This company does not use animals to test their product and their ingredients are not animal-based. Seventh Generation offers a new stain fighting formula that is supposed to be excellent in stain removal due to the addition of non-animal derived enzymes to the formula. However, this product is still gentle on fabric and not harmful to the environment. Seventh Generation detergent is kosher certified and it is safe for grey water and septic systems. It is fragrance free (no artificial fragrances added), which is beneficial for those who are sensitive to good and bad odors. The suds from this detergent wash out much easier than conventional laundry detergents, leaving your clothes feeling fresher. Seventh Generation works in all temperatures of water and removes even set-in stains. It is gentle enough to use on infant clothing, blankets, towels and washcloths and yet, also works on cleaning out messy diaper stains. This eco-friendly detergent is successful for pre-treating stains as well as using it in the washing machine for the entire load. Ultra-concentrated, with a shelf-life of about two years, Seventh Generation is economical. Available online, the Seventh Generation company makes their product obtainable by anyone who might not have a store in the vicinity that carries their products. The container is easy to manage with a large handle and large spout and the container is recyclable. for using Seventh Generation Natural Liquid Laundry Detergent, consumers reported they would probably continue to purchase the product. 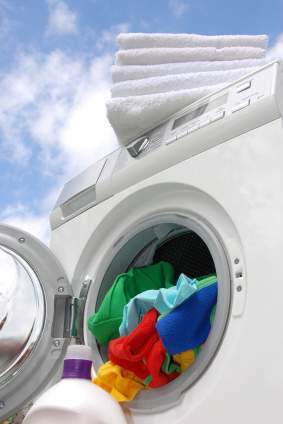 A few consumers have reported that the liquid detergent makes their clothes smell stinky even after drying. The price of this product is a bit higher than other eco-friendly marketed detergents. Gym clothes still have a heavy body odor smell after washing with Seventh Generation detergent. White clothing, towels and fabric in general don’t come out sparkly white with this detergent, so other harsh chemicals have to be used, which defeats the purpose of using an eco-friendly product. Overall, Seventh Generation Natural Liquid Laundry Detergent seems to live up to its claims of being friendly to the environment and not testing their products on animals. It seems to work for the majority of fabrics and clothing. Because the Seventh Generation natural laundry detergent makes use of natural ingredients, it can be considered safe. The detergent is non-toxic and hypoallergenic, so it is ideal for use on baby clothes and other delicate materials. It is even advisable to use the same safe detergent on all your clothes. You do not have to have a baby in the house to take advantage of the gentleness of the Seventh Generation laundry detergent. The laundry detergent makes use of vegetable enzymes and has not been tested on animals. An all-natural laundry detergent, Seventh Generation is environment-friendly. Not only is it biodegradable, but it also saves a lot of petroleum in a year. In the US alone, a total of 113,000 barrels of oil could be saved if every 50 oz. of petroleum-based detergent is replaced by a 50 oz. natural detergent from Seventh Generation. In relation to being safe, Seventh Generation products in general do not make use of toxic ingredients as they make use of a vegetable base. The laundry detergent from the company does not contain any optical brightener and resists using dyes and fragrances. Some consumers have actually noticed that even the supposedly scented variants have rather mild smells. The Seventh Generation Company is concerned about following proper ethics, following what is considered to be just not only to humans but also to animals. Because of this, the company’s laundry detergents and other products are made without being tested on animals. The company recognizes that it is more important to preserve the health and safety of humans and animals than to make use of easy processes to produce its detergents. The laundry detergent is not all hype and environmental image. It actually works as it should. The Seventh Generation laundry detergent cleans clothes thoroughly. Even the powder detergents are able to perform well without leaving chalky stains on the clothes. Other powder detergents may clean clothes properly but leave white residue. The clothes end up looking as if they have not been washed at all. Seventh Generation manages to create a powder detergent that removes stains without adding new ones. Washing machines sometimes have mildew problems. Because of this, you may wonder if you are really cleaning up clothes when using such mildew-infested washers. What you need to do is use Seventh Generation laundry powder detergent to get rid of mildew and keep your washing machine mildew-free. Actually, it is the fact that it is a powder that makes the detergent effective against mildew. Having the Seventh Generation brand makes it even better. The Seventh Generation laundry detergent makes use of mild scents. Examples of scents are blue eucalyptus & lavender and white flower & bergamot citrus. These are very mild scents because the company does not really subscribe to putting fragrances into their detergents. The company wants to make sure that the detergent remains natural, safe, and hypoallergenic--benefits that seem to go hand in hand. These mild scents may not even register well, fading fast after use. Consumers who want more scents on their laundry may have to use a dryer sheet from another brand. Of course, if you have a baby at home, you are better off with Seventh Generation’s scented and non-scented variants. One box of Seventh Generation laundry takes a long time to use up. There are sizes that can go for as much as 42 loads. Imagine having to finish the whole box after 42 laundry days. If you do not really have a lot of laundry, your detergent can go much further. So, do not be guilty if you are using your Seventh Generation natural laundry detergent for your own clothes and not just for your baby’s. If you cannot afford to buy the box with 42 loads, you may try the package for 18 loads. Some intense detergents can be abrasive, so they are not safe for your skin. With Seventh Generation detergents, you do not even have to worry about your colors fading. The detergent is not just safe on skin but also on colors. It can clean your laundry without making the colors fade. Not only does the detergent preserve color, but it also heightens or brightens the colors. Your clothes will seem new for a much longer time. If you want to wash delicate clothes, such as baby clothes, you may want to use the cold setting on your washing machine. This is to help preserve your clothes. The problem with using the cold setting with other detergents is that cleaning is not that well done. Germs are best removed at higher temperatures. High temperatures, however, could ruin delicate clothes. With Seventh Generation laundry detergents, however, clothes can be cleaned properly germs and all without ending up in tatters. The detergent is ideal whether you are using the warm or cold settings. You do not have to look for another detergent or choose between cleanliness and good-looking clothes. Though more expensive than other detergents, the Seventh Generation natural laundry detergent makes up for this with good performance and strength. The detergent’s strength is both effective and gentle. It is this strength that removes stains and sustains color. It is also the strength that makes even a small amount of the detergent work well, enabling a box to last for much longer. In the end, the detergent is cost-effective. Of course, it should never be forgotten that buying the detergent is supporting the causes against animal testing and for environment-friendly products.